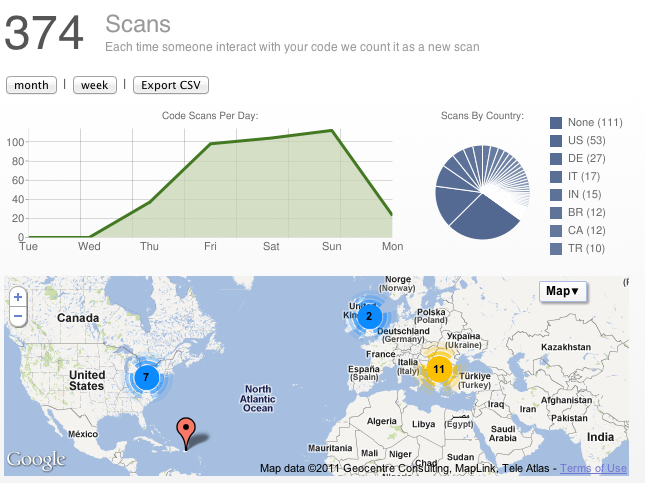 We are constantly improving YouScan.me with new features to ensure that you get the most of your QR Codes. Recently we made YouScan.me available in several languages, added Campaigns Manager and made many improvements to the dashboard and generation of QR codes. Now we are very happy to announce you the new location tracking feature. Location Tracking is available now when generating QR Codes. You can enable or disable it depending of your needs. You can enable Location Tracking from the checkbox which is shown below and it is available for all 3 types of codes we support. For example if you have only one QR Code located on the store’s window there is no need for location tracking of those who scan, because you know exactly where people have to be in order to scan your code. Location Tracking is very useful if you have a QR Code printed on newspaper or magazine ad, or sticked to different locations. By using this feature you get insights of what are the best spots to put your QR codes and eliminate the ones which don’t perform well. Key West Express are among the pioneers utilizing our QR codes and have incorporated them into all print advertising. They are aware that without track ability it is not possible to know how to correctly allocate advertising monies. With the new Location Tracking every QR code is not only trackable – it allows to actually see when the codes are scanned, what device is used and where was the person who scan. We are tracking the date and time each of each scan along with information of device’s OS and will show you this info in the Dashboard. Below is screenshot of how stats looks like on one of our beta testers, Android Freeware. Note that when you create QR Code with Location Tracking enabled those who scan will be prompted to “Allow Sharing of their location” which will make a little longer the process to get to your content. Don’t forget the in many cases the small things are responsible for much better ROI. Thanks for the mention, of Key West Express, again!! Our codes have now all been “location” trackable!! Very cool and will be put to good use! !